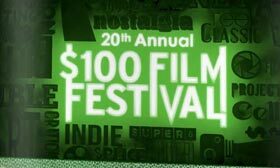 The 20th annual $100 Film Festival, which was held over the weekend in Calgary on March 8-10, has announced their award winners. Since the fest is devoted solely to screening short films shot on actual celluloid, awards were given for Best 16mm and Best Super 8 films, as well as awards for Audience Favorite and the regional award Best of Alberta. The Best Super 8 award went to San Francisco based filmmaker Paul Clipson, who works exclusively with this type of film. His winning Caridea & Ichtyes is part of his “Compound Eyes” series of films on aquatic life. The Best 16mm award went to another U.S. filmmaker, Ross Meckfessel, for his He, She, I, Was. The local Best of Alberta winner, Contingency by James Beattie Morison, was actually a film made specifically for the festival chronicling its history. The $100 Film Festival is also a truly international event, highlighted by the fact that the Audience Favorite went to a Japanese film, EDEN, directed by Shinya Isobe. In addition to congratulating the award winners, the Underground Film Journal wishes to say a fond goodbye to outgoing $100 Film Festival program coordinator Melanie Wilmink, who is moving on to other endeavors. We began running news about the fest on the Underground Film Journal thanks to outreach by Wilmink and we wish her the best of luck in wherever she ends up. Her successor has big shoes to fill. The history of the $100 Film Festival. Several times along the way, the idea very nearly died in obscurity. Strangers on the street as I tell their, and my own, life stories. By switching between presumed fact and fiction, the film calls its own validity into question. Fish & crustaceans appear to swim within an ether of natural and unnatural energies. Last summer, the sun brights. A man is in danger, so he writes a postcard to Robocop asking for help. The huge ruins of the old Matsuo mine in Iwate Hachimantai. Once, the place was called “the paradise on clouds” and there was 10,000 people’s life. With this work, it tried to express time to be in that place.